I'm back again with another gear grinding issue but this one is a bit less critical. 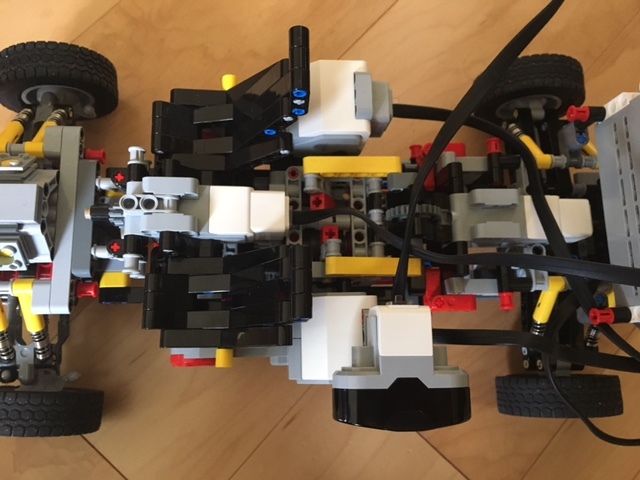 The grinding only occurs when my 4x4 SUV chassis (with Sariel's 4-Speed Sequential Transmission) is in a certain gear. 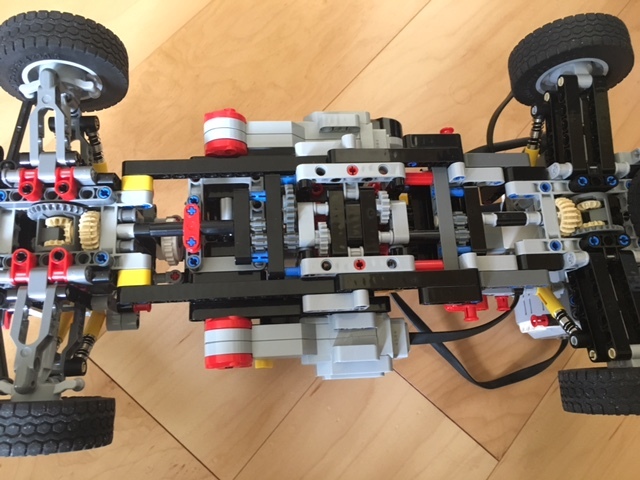 Here's some photos of the chassis. The transmission is shifted to the speed where the nonstop grinding occurs. When in this gear (I believe it may be 3rd) The car is supposed to move, but it does very slowly while clicking noises fire like a machine gun. This is the only time when the gears grind other than, say, if the chassis hits a wall. When the clicking begins, I hear the driving rings shake (which awfully reminds me of the somewhat gear clicking in the Mercedes-Benz Arocs set). I would love a response a soon as possible to address the clicking problem so I can finish the chassis once and for all. I have no idea. I have never built one of these. It seems it is too much power. @Aventador2004 I think the issue might be that I should replace some gears a little or something. The last time I switched gears the clicking reduced a shy bit, so I could give it a try. The only time I've had this happen was in the first iteration of my 4speed in my current car, after a while 1st and 3rd would click and not even move. The issue was I had not secured the gearbox enough and it had moved apart enough that the gears were skipping! My second design has been flawless so far and is driving around 5+ pounds. @DugaldIC I think I reinforced my gearbox a lot, but you have a point. Do you have a link where I can see the gearbox to see where you reinforced it? Unfortunately I won't have a picture of it until I do a teardown, but that means I have to finish it first haha! @DugaldIC I found where the gear grinding was. It was from the two black gears in Sariel's gearbox, but I don't know how to fix/reinforce it. Can you tell me how you reinforced the back of the gearbox where the two black gears are? Could you make a picture please? 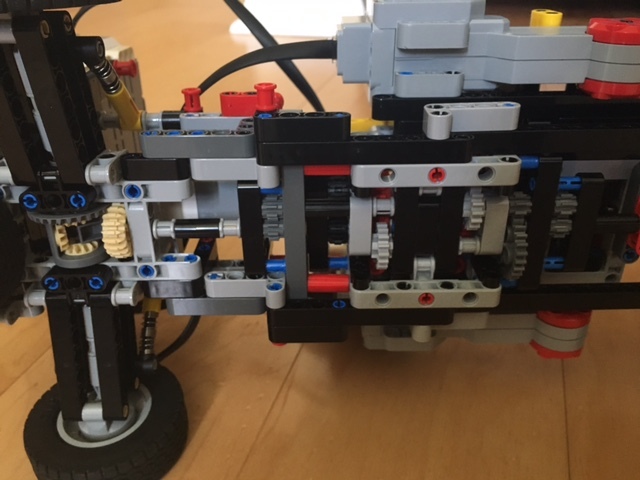 @DugaldIC Can you tell me how you reinforced the back of the gearbox where the two black gears are? That parts a little hard to explain, I'd recommend having things locked in length, width and height wise so nothing can move. Brace gears by having a beam on either side of them and try not to use connectors unless they themselves are braced. Do you have a picture of your gearbox? Do you have a picture of your gearbox? I'll get the picture ready tomorrow. I was just looking closer at pictures you do have and it may not be the gearbox but the two 8teeth gears you have at either end of the gearbox. I don't know, but I also get lots of clicking from the rear differential gear, but most of it comes from the inside of the gearbox. If it's clicking from the gearbox it needs to be reinforced (I'd say the left/right need tying together better), if it's the diff I'd say you're not geared down enough and you have too much speed and not enough torque to move it! 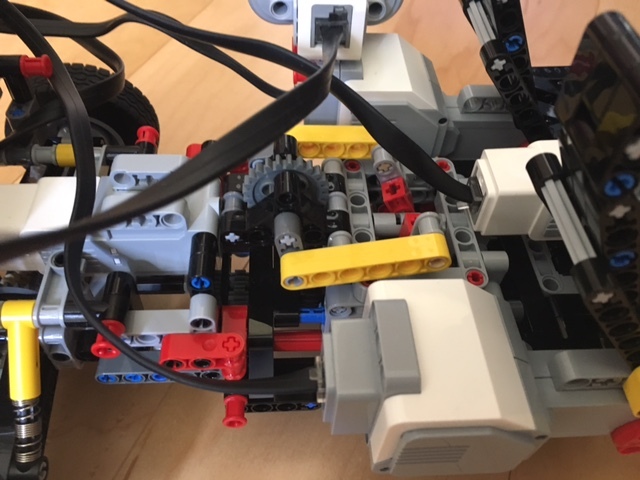 Other than that you're left with the two 8teeth gears which are prone to slipping, you can correct this by using the black 12t/20t combo which line up perfectly one stud over and one up on a diagonal. That's how I centred mine and I don't have issues, also my drive is geared down significantly so only 4th gear is a typical drive speed the rest are super slow. I hope that makes sense! Nice, dude! I'll get straight to work on the gearbox right now. Thanks for all of the helpful replies! Guess what? I found an issue that might have been causing the clicking in the gearbox: One of the axels connecting to one of the driving rings has been pulled out, maybe that's where I need to reinforce. I found this issue when the gearbox couldn't shift right to first gear and got stuck in neutral. Bad news: The gearbox sometimes has trouble shifting into first gear. Maybe I should only shift in one motor direction. Also, the clicking occurs rapidly whenever the car hits a wall. The steering is also a bit flimsy. In order to make this an okay on-dirt car, the clicking should only occur when a wheel stops, but I hope this doesn't ruin its 4x4 presence. 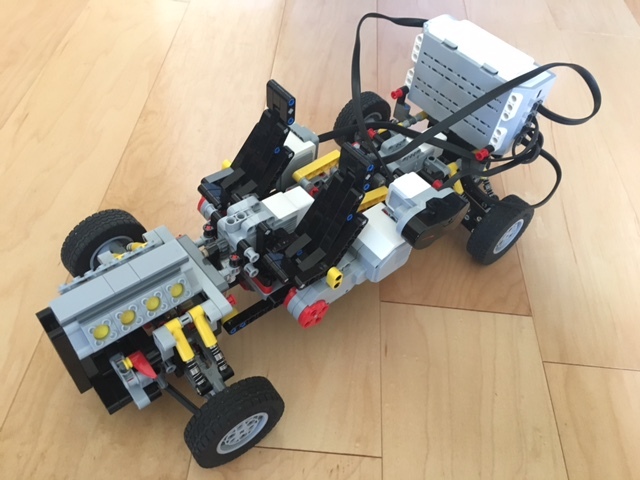 Overall, I got just a little issues left to fix before I'm ready to program the EV3 brick. Well I'm glad I was able to help and it looks like you solved your own mystery! Sometimes your only option is to tear it all down and figure out the weak point!